Protecting your hands and picking the right boxing gloves is very important whether you are an amateur boxer, professional boxer or someone looking to keep fit with boxercise. 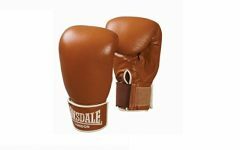 The Lonsdale Authentic Leather Bag Mitt is made with quality genuine all cow-hide leather and comes with extra dense resilient inner foam layered mould. The glove is built for long-lasting performance and hand protection, allowing for countless hours on the punchbag.